The International Computer Music Conference took place this year in Belfast, Northern Ireland, hosted by Queen’s University’s Sonic Arts Research Centre (SARC). Founded in 2003 as a centre dedicated to the sonic arts, SARC is the brainchild of composer and music technologist Michael Alcorn, SARC’s director. Alcorn and his indefatigable team took a more-is-more approach this year mounting an ambitious conference. Through four daily concerts, up to eight paper/poster/demo sessions a day, continuous musical presentations, workshops, and installations at four different venues, Belfast experienced over 150 live performances, over 200 pieces, 187 papers/posters/demos, 3 workshops and 9 installations, all in six jam-packed days. Performance by the Roots Ensemble. The theme of this year’s conference was “Roots/Routes”. Expressed by the organizers as “an opportunity for the investigation of the interface between technologies which develop through international collaboration and the specificity of music cultures rooted in a place,” the theme along with the conference setting provided a rich backdrop for artistic exploration. A feature inspired by this years theme was the creation of the Roots Ensemble, a group of musicians skillfully assembled by Franziska Schroeder saxophone player and the ensemble director, who brought together new music virtuosi such as flautist Carin Levine along side traditional music players like Laoise Kelly, on the Irish Harp. The Roots Ensemble allowed composers to explore a wide range of musical styles and pursue unconventional instrumental combinations. This year’s Music Chair, Pedro Rebelo invited a diverse group of established artists from George Lewis to Pamela Z to serve as curators of individual concerts. They were charged with selecting and arranging the pieces for each concert giving each event a theme often reflective of the musical personality of its curator. The concerts took place in three different venues each with a different style: The Sonic Lab, SARC’s flagship acoustic space; The Whitla Hall, a large concert hall; and The Mandela Hall, a small club style venue with adjoining bar for late-night concerts. There were two afternoon concerts a day held in SARC’s Sonic Lab. This “cinema for the ear” is a unique acoustic space with a 48-channel diffusion system, acoustically transparent grated floors and fully-modular sound reinforcement which allows one to adjust panels and curtains to transform the sound of the room. The 150-seat house was packed twice-a-day throughout the week, many undoubtedly there to hear the room in its full sonic glory. Several pieces were written specifically for the Sonic Lab, notably Brian Cullen’s Thrice Removed, which presented sounds moving through the sonic lab that corresponded to creatures in an animated film moving through a virtual three-dimensional space based on the Sonic Lab’s architecture. A surprisingly diverse range of pieces for multi-channel diffusion were presented here from acousmatic pieces such as Mathew Adkins’ Five Panels, presented in a concert curated by Adrian Moore, to pieces employing live-interactive devices from turntables to live video capture in a concert curated by Nic Collins, to works that employed pure synthesis and in some cases algorithmic generation of music like Collins’ C28. Ricardo Climent — Russian Disco, for clarinet, flute and electronic expression. The Whitla Hall presented a more formal large hall setting where many of the concerts featured the Roots Ensemble. There were pieces like Sean Pequet’s Chord and Ricardo Climent’s Russian Disco that used the computer to mediate communication and interaction between performers with their interaction affecting the computer-generated sounds. There were several works that exploited the medium of the network, notably by Juan-Pablo Caceres and Alain Renaud’s Net: Disturbances, where Caceres joined Belfast via the net from Stanford, California USA and developed a patch which uses the inherent network delay as a means of sound processing. There was also a three-way network jam with the Roots Ensemble joined by Pauline Oliveros and her group Tintinabulate in New York and Chris Chafe and his group SoundWire from Stanford using networked haptic devices as a means of inter-ensemble communication. 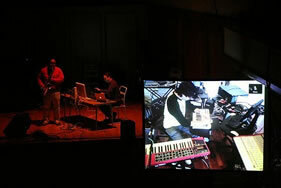 The George Lewis curated concert involved several pieces that focused on performer computer interaction and experimental interactive instruments such as IBITSU’s e-clambone and Tobias Grosshauser’s sensor-laden violin. Caceres/Renaud — Net: Disturbances and Pauline Oliveros — Tele-Morphosis. The Mandela Hall is where the late-night concerts took place in a more relaxed atmosphere. There was an emphasis here on multi-media and alternative media pieces, from Anna Fritz’s Radio is Everywhere in their Dreams — which filled the hall with suspended radios — to Margaret Schedel and Alison Rootberg’s theatre piece, The Color of Waiting, for interactive video, electronic cello and dancer. 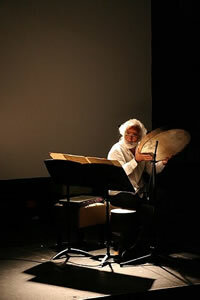 The Roots/Routes theme was present in Luigi Ceccarelli’s De Zarb à Daf where traditional Persian percussionist Mahammad Ghavi-Helm joined a barrage of spatialized samples and live-processing. Live coding was on feature at the Mandela Hall with Matthew Yee-King working in Supercollider and the Pd~graz boys Florian Hollerweger and IOhannes zmölnig sporting an animated Pd patch and passing messages to the audience between code. Georg Essl and Ge Wang brought MoPhO their mobile phone orchestra to Belfast for an intriguing technologically-advanced, lo-fidelity set. Mahammad Ghavi-Helm performing in De Zarb à Daf. Ge Wang performing his mobile phone. One popular concert feature worth mentioning were the nine or so Exit-variations. These were small pieces commissioned from composers such as Barry Truax and Elainie Lillios that informed audience members where the emergency exits were and asked them to switch off their cell phones. 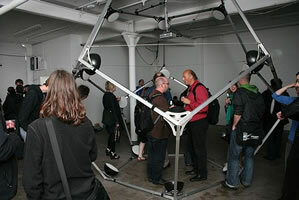 Installations were mounted in galleries and venues located throughout Belfast. Daniel Bisig, John Flury and Martin Neukom presented ISOkaeder, which explored swarms where visitors could interact with a sonic swarm through live camera tracking. Heike Kaltenbrunner’s About Life and Death of Neutron Stars and TVsets employed pulsar-signals and the live stream of a radio telescope to generate sound and images which were displayed on and eventually destroyed cathode tube based TV sets. Some installations sought to connect to the city of Belfast and its history. Úna Monaghan and Nóirín Nic Alastair’s Píosaí featured evocative bronze sculptures that radiated sounds of Belfast when touched or approached. Both the sounds and sculptures reflected the experience of growing up, living and working in Belfast. 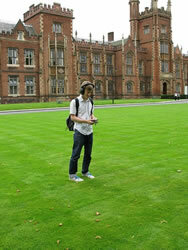 David Drury’s powerful locative media piece Peace Lines employed handheld GPS/media devices. The GPS-based diffusion played audio cued to a visitor’s movements through parts of Queen’s University and sought to evoke the experience of walking along one of Belfast’s peace walls, which were erected to stem outbreaks of violence between Catholic and Protestant neighborhoods. Drury made field recordings from both sides of the barrier and presented interviews of residents living near by the wall. Martin Neukom — ISOkæder and Úna Monaghan and Nóirín Nic Alastair — Píosaí. Paper chair, Maartin van Walstijn organized papers into several key topics: Languages and Environments, Interaction and Improvisation, Sound Synthesis, Computational Modeling of Music, Aesthetics, History and Philosophy, Algorithmic Composition Tools, Mobile Computer Ensemble Play, Interface Gesture and Control, Spatialization, and Sound Processing. There were three panel sessions covering hot topics in electronic music. The panel on Re-inventing Audio and Music Computation for Many-Core Processors saw input from the likes of David Wessel and Miller Puckette reflecting on how multi-core processors might change the face of computer music. The panel on network performance assembled an international group of scholars and artists many of whom have been involved with network based music from its inception. Their discussions revealed the broad range of considerations to be taken into account in this rich new medium. Two workshops were offered at this year’s conference. 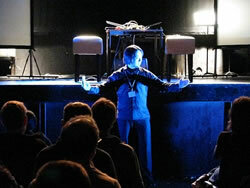 Ben Knapp offered one on music-making with biosensors that ended with a multi-media theatre piece, The Reluctant Shaman. Another workshop was given on network performance where attendees were introduced to basic tools such as JackTrip and Jamlink. The keynote this year was given by Trevor Wishart who gave a very personal reflection that examined Wishart’s long association with electronic music and his thoughts on current trends and future possibilities. Delegate experiencing David Drury’s Peace Lines. A good sign that ICMC 2008 was a smooth and well-run conference was the lack of discussion of the administrative aspects of the week and conversations predominantly about the content of the pieces and papers. The day-to-day functions were transparent, sound happened when it was needed, projectors, lights, microphones all worked on demand. Concerts started on time, people could find where they wanted to go and be where they needed to be. Kudos are in order for SARC’s ICMC team. This year’s conference, with its ambitious agenda truly allowed delegates to experience the breath of the international computer music community. The many diverse, scholarly and creative voices heard from gave us plenty to take home and reflect upon until next year. More photos from ICMC 2008 can be found on Flicker: http://www.flickr.com/groups/icmc2008. Justin Yang grew up in Torrance CA, real home of the fictional Torrance Community Dance Group who were featured in the video for Fatboy Slim’s hit Praise You. Yang is a composer, improviser, and music technologist currently working on his Ph.D. in Sonic Arts at the Sonic Arts Research Centre in Belfast. He is researching new paradigms and metaphors for real-time music making with live performers and interactive electronics, writing pieces that employ computer-animated notation coupled with live, interactive sound processing.